A quick update for those of you are using Ubuntu 10.10 Maverick Meerkat or 10.04 Lucid Lynx and want to upgrade to the latest Firefox 7: the new version is now available in the Firefox stable PPA. 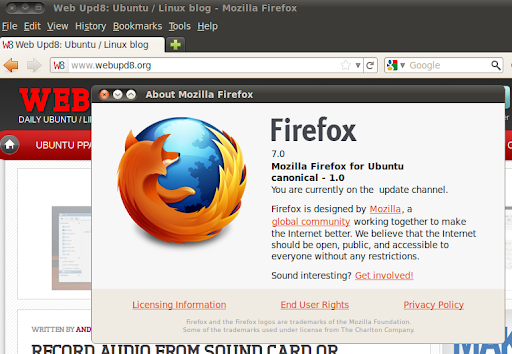 Firefox 7 should be available in the official Ubuntu 11.04 Natty Narwhal and 11.10 Oneiric Ocelot repositories very soon. Firefox 7 is brings improved memory usage and sync, CSS3 text overflow, Azure for improved HTML5 animation, web timing spec - a feature that enables developers to measure page load time and more.